Our life is a string of moments. It is easy to get lost in the moments of our past and the moments that are yet to come, but there is an invisible string that holds all these moments together and allows us to see these moments from a constant string of perspective. This perspective changes and evolves even though the moments stay the same. In each of the these moments we have a choice. 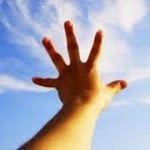 It is this act of "reaching" from moment to moment that is often overlooked. We must reach in order to get from this moment to the next. It is what we are reaching for however, that can change the outcome of the next moment. Some of us reach for things, such as money, the house, the car, etc. Some of us reach for a feeling such as sadness, happiness, joy or anger. Some of us are reaching for a moment that has already passed or a moment that may never come. It is our reach that really tells us about our intentions. Most of us are not even aware of what we are reaching for and often this leads to idleness. This is where your reach is simply from one moment to the next, and growth is stagnant. We do not realize however that it is in this reach that we can go from one moment to the next, or we can reach even farther. What this means is that your intention from each moment determines what you are reaching for. If you are simply existing to reach to the next moment, then we are really not building a strong thread that is needed to hold all of our moments together. Reaching is like weaving the thread that holds all of our moments together. When we reach with good intentions we are creating a strong thread that will keep us supported when we arrive at a challenging moment or a difficult time. On the contrary, when our intentions are destructive we may not realize that we are weaving instead a weak thread that will not support us well in times of need. First, we must be mindful of what exactly we are reaching for in life, for whether we realize it or not, the process of reaching is what creates the quality of the invisible thread that strings together all of our moments. In essence, whether we arrive at our destination or not, or whether we actually "reach" what we are reaching for, it does not matter, what matters is what you are reaching for in each moment because even when we arrive at that for which we have been reaching for, often we are already reaching for something new by the time we get there. It is a constant ebb and flow of reaching without a real destination. Often the destination is only an illusion for by the time we get there we are already onto the next and then the cycle continues. This is why it is so important to pay close attention to exactly what you are reaching for as it is this process that builds the core of who we are. Let us reach to be the best person we can be. Let us reach to have gratitude and appreciation. Let us reach to help others. Let us reach to live in this moment and see the beauty in all that is around us. Let us reach... into the beyond.